Ernie Martinez will never ever forget the time he suggested to his friend Stephanie Smith-Rothaug that she have a look at a Beach Towel mare who was in foal to Astreos. They were at the Harrisburg Sales at the time and the well known American harness racing owner and breeder said if the sale didn't work out he would even buy it off her. “I told Stephanie that if she could get the mare in foal for $15,000 it would be a good buy. I thought she was in foal to the right horse and when she got her on a $6,000 bid I thought what a hell of a buy that was. “I even said to Stephanie if she signed the ticket and don’t like her I would take the mare off her hands,” Martinez said. Within two hours of the Sale Smith-Rothaug had fallen completely in the love the un-raced mare. “I remember Stephanie telling me the mare was gorgeous. I told her if you are happy then I’m happy,” Martinez said. The following year Wheres The Beach foaled a 2004 colt named Stars On The Water. It was the third year in a row that the mare had been bred to Astreos. Then when it came time to looking to breed a fourth time Smith-Rothaug sought Martinez’s advice and he suggested there was an underrated sire in Canada worth looking at. “Stephanie originally wanted the mare served by an American stallion but I suggested the Ontario, Canadian stallion Mach Three telling Stephanie his service fee was $7,500. I had a Mach Three promotional breeding for work I had done and was quite certain the mare would cross well with him. “I also knew Stephanie was going to get married within a couple of weeks and sadly I couldn’t be there with her so I said I would give her the breeding I had to Mach Three as a wedding gift. “I have to thank Joe Muscara and John Curtin for giving me the promotional service to Mach Three. I was a big fan of Mach Three myself and did a lot of work in those days promoting him. It just goes to show you that promotional breedings are well and truely worth the effort by the studs in promoting their stallions. “In giving we receive and now more than two seasons after ‘The Beach’ last raced hundreds of thousands of people throughout the world have been able to witness one of the greatest standardbreds to have ever graced a racetrack. Somebeachsomewhere, the 2008 Horse-of-the-Year, compiled over $3.2 million in 21 races, winning 20 of them for earnings of $156,655 per start. Somebeachsomewhere banked $2,448,003 in 2008 during his three-year-old campaign, a new record for single-season earnings. By the end of Somebeachsomewhere’s perfect (six-for-six) freshman season, the mainstream media had already came to court 'Beach'. In 2008, Somebeachsomewhere was one of the biggest news and sports stories of the year in Canada. He was considered for the Lou Marsh Award honouring Canada's athlete of the year. He was featured on CBC’s The National news program and he was named the Newsmaker of the Year for Nova Scotia by the CBC. He was profiled in the nation’s biggest newspapers and on national radio. He and his connections made the cover of industry trade publications 18 times. World-wide he was also an internet star with his own website. 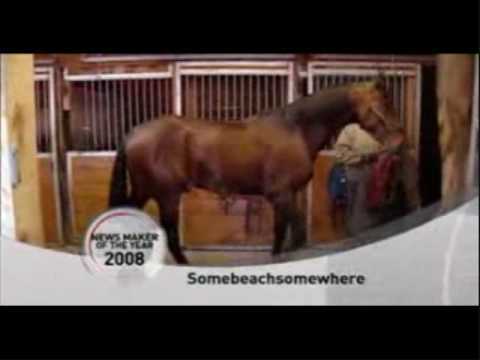 Somebeachsomewhere was born in Ohio on May 25, 2005. His last start was at The Meadowlands on November 29, 2008, when he and reinsman Paul Macdonnell defeated Shadow Play and Blueridge Western in the $500,000 Breeders Crown in 1:51.1 – 4.7 seconds slower than his world record time of 1:46.4 recorded in the Bluegrass Pace at The Red Mile on September 27, 2008. Stephanie Smith-Rothaug, who owns Rails Ridge Farm, always felt Somebeachsomewhere would be a nice racehorse. “The mare didn’t have a problem foal and he was the prefect colt right from the beginning. He was a very athletic type who as a yearling would bite his two field mates and always want to be vigorous and run around after a workout. He was very intelligent, the sort of horse you only had to teach him once and he could do it,” Smith-Rothaug said. When she went to sell him at the yearling sales Smith-Rothaug said she would have been happy just to fetch the price of the sire’s fee $7,500. She got $40,000. “He was the first horse at the Sale and because of the races being held over there that day, there weren’t too many people there, so when he was sold to Brent McGrath and several business owners from Truro, Nova Scotia, Smith-Rothaug was over the moon. “I was delighted that he fetched that much and I couldn’t believe how excited Brent was as well. Straight after the Sale he came down and looked the horse over and repeatedly told me how happy he was. “I’ve been to many sales before and new owners don’t usually do that. That’s when I thought ‘Great my beautiful colt is going to a good home’. I was so happy for the new owners and of course the price he fetched,” Smith-Rothaug received. Martinez said when Somebeachsomewhere was racing, it also provided happy days for Smith-Rothaug’s husband who was diagnosed with cancer and passed away not long into their marriage. “The horse gave them a lot of happiness. I was so pleased that Stephanie’s husband got to watch Somebeachsomewhere race during his final days. I know it gave him a lift,” Martinez said.